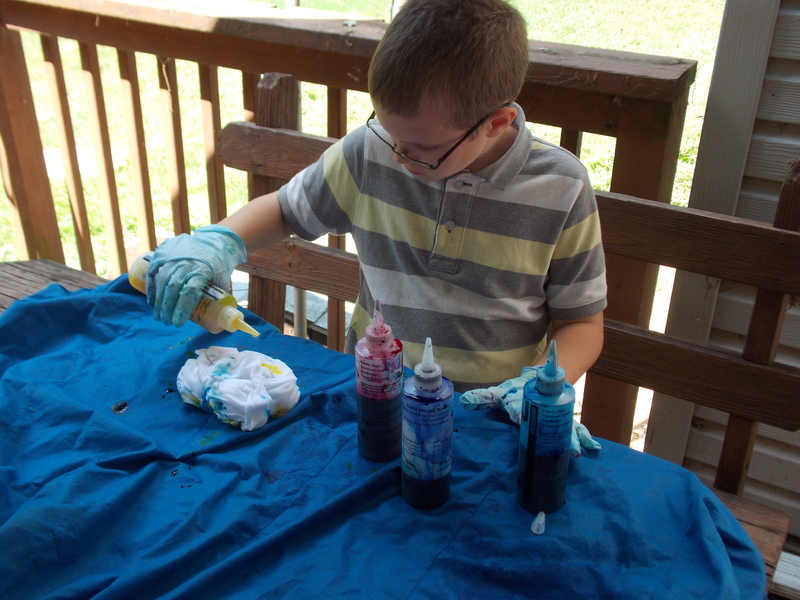 One of the items on our summer bucket list was to tie-dye T-shirts. 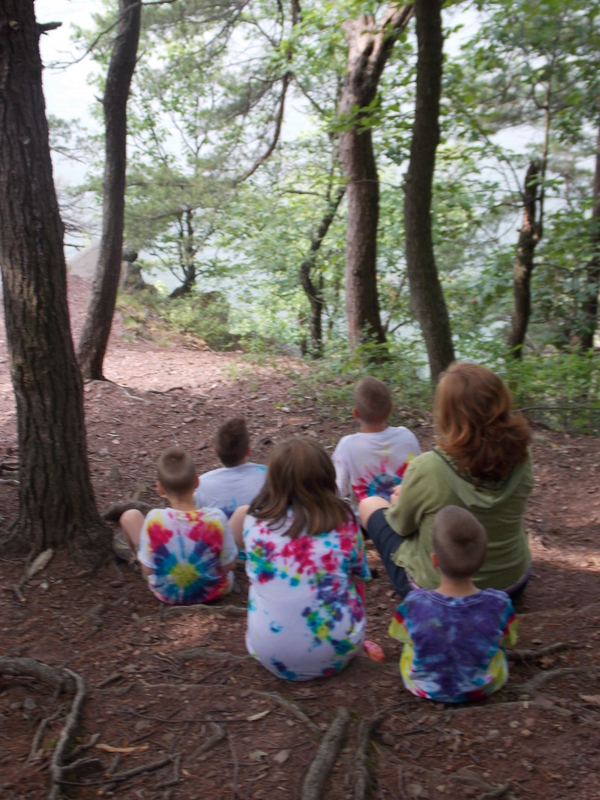 We took advantage of a nice day about a week and a half ago to do just that, then were able to wear them to Raystown Lake where my side of the family took a little vacation last week. 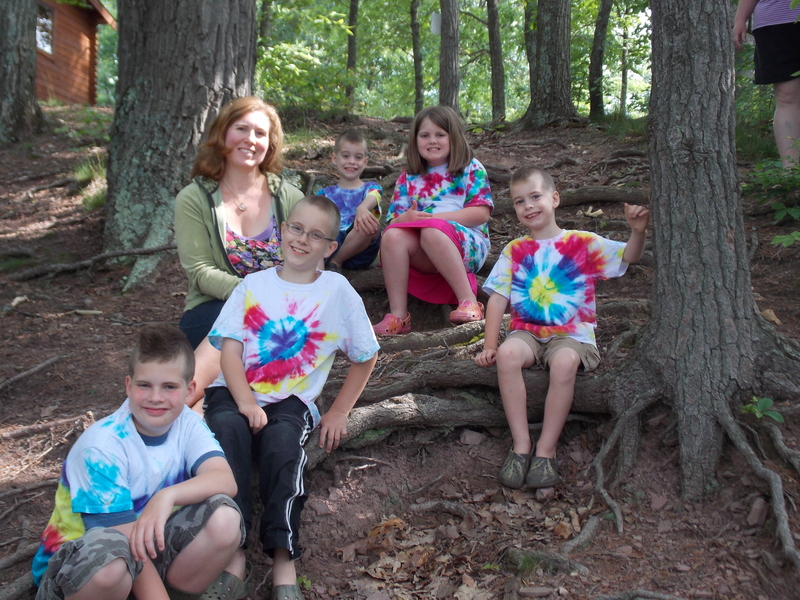 I had no idea how they would turn out as I hadn’t tie-dyed a thing since I was in elementary school. Which was, um, quite a number of years ago and I’m sure I was just doing what the teacher instructed us to do. Thankfully in our tie-dye kit (Jacquard brand) there were clear instructions as well as a pretty informative DVD that showed us how to do the different designs. Each one is a little bit different, which is the beauty of tie-dye I guess. We started out with plain white cotton tees. The kit contained a powder (soda ash) that you mix with water to make a solution, then soak your item in it for 20 minutes or so. When done soaking, you can then make your design using rubber bands. I tried the scrunch method, bulls-eye, spiral, mirror image, and stripes. After rubber-banding all of your items, give them another good soak in the solution. In the meantime, get your dyes ready. Our sweet little kit had them ready to go in bottles, you just had to add some water and shake ’em up. The next step is to add your color. This was by far my most favorite part of tie-dyeing. I don’t think you can really “mess up” as they are all supposed to be unique. After the color was on, I put each separate piece in a plastic bag to sit for a day. 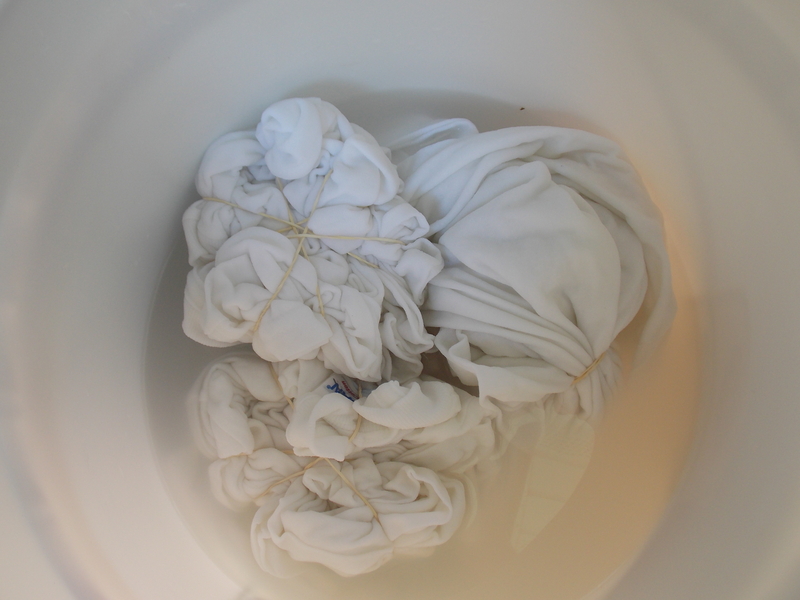 Once the day was up, I took off the rubber bands and rinsed each T-shirt out well, then gave them a good washing in my machine. It was fun to see how our creations came out! …and a view from the back. 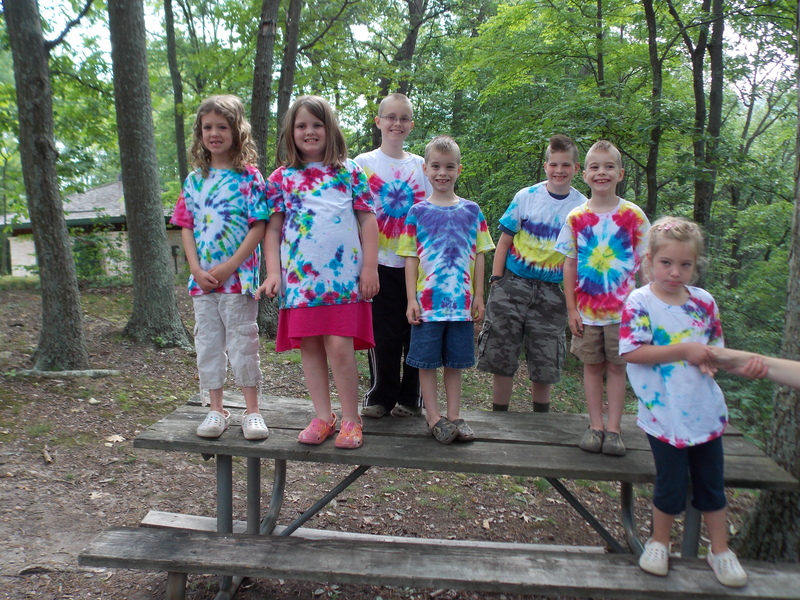 As you can see, the kiddos then wore them to Raystown Lake, where we had a good time with family. All in all, I really enjoyed tie-dyeing and would enjoy messing about with it more and trying out some different pattern ideas. So today’s post is a bit different from what I normally put on here. Today I am sharing/venting about something that happened this week that really bugged me. It all has to do with food. First of all, y’all know I love to make stuff. Pretty much anything DIY and you know I’m all over it. One of the things I really enjoy making is bread. This is something I really do on a regular basis, baking bread at least every other week. Typically I make a few loaves, we eat one right away and I freeze the rest for future consumption. However, I do buy some bread items occasionally as well, usually scoring them for around a dollar each. By the way, if you never make your own bread, I in no way judge you. Not everyone has the time, patience, or even desire to make their own bread. I’m just weird like that. 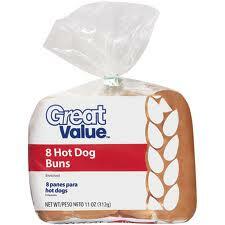 Anyhow, sometime within the past month I bought hot dog rolls from Wal Mart, getting their Great Value brand pack. Somehow we ate most of the pack and apparently one lonely hot dog roll got lost in the depths of my bread box. 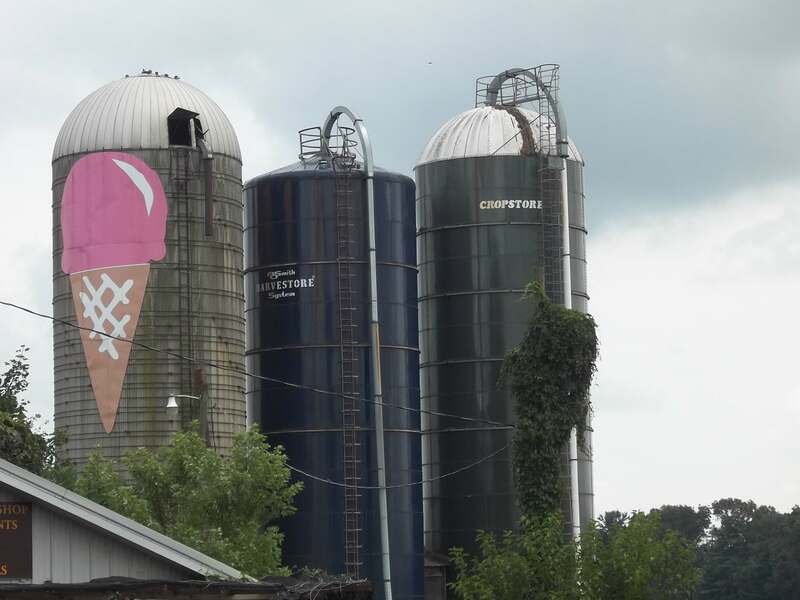 I have no idea how I missed it, but somehow it just surfaced yesterday. Now granted, I can’t remember the exact date we opened this pack, but I know it had to have been probably three weeks prior to my finding it again. That lonely hot dog roll looked and smelled exactly the same as when I bought the pack. It wasn’t hard, funky, or even starting to go moldy. What does that tell you and I about what is in these rolls/buns? Um, the word “preservatives” comes to mind. Lots of them, I’ll bet. I turned the package over to check the ingredient list. I only knew what a few of the ingredients actually are. As for the rest, I would have to have a pretty good knowledge of Chemistry to even have a clue what they are. This is just a little scary to me. And it makes me glad that I’m weird and enjoy making my lovely loaves of bread. I know exactly what is in them, and they’re pretty good too. Anyhow, I just had to get the hot dog roll incident off my chest. (For an even scarier one, check out this link and read the whole way through to the bottom.) It just makes me think of how we should all be more mindful of what we’re putting into our bodies on a daily basis. We don’t do too shabby around here, but I know there’s times we could do better. That’s all for now, I just thought I had to share that! 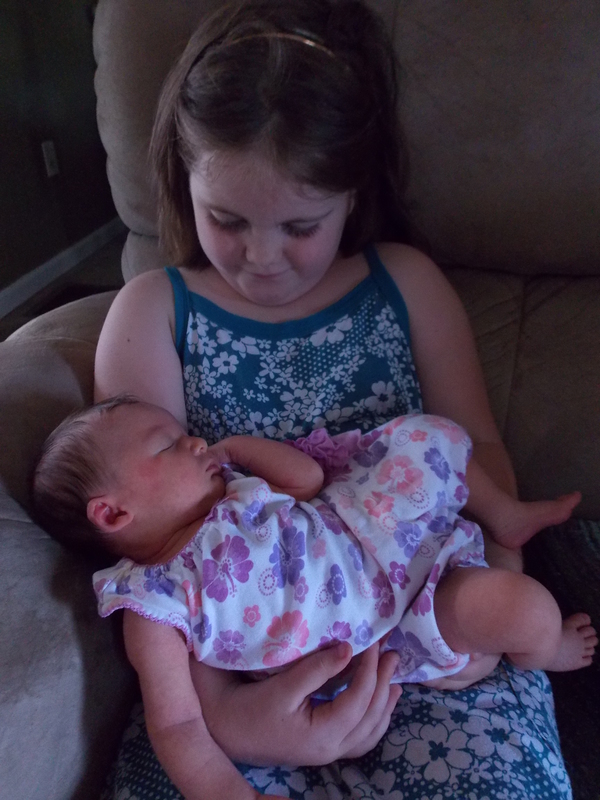 Well, school is out and we’re all getting used to our new summer schedule. So far, so good! 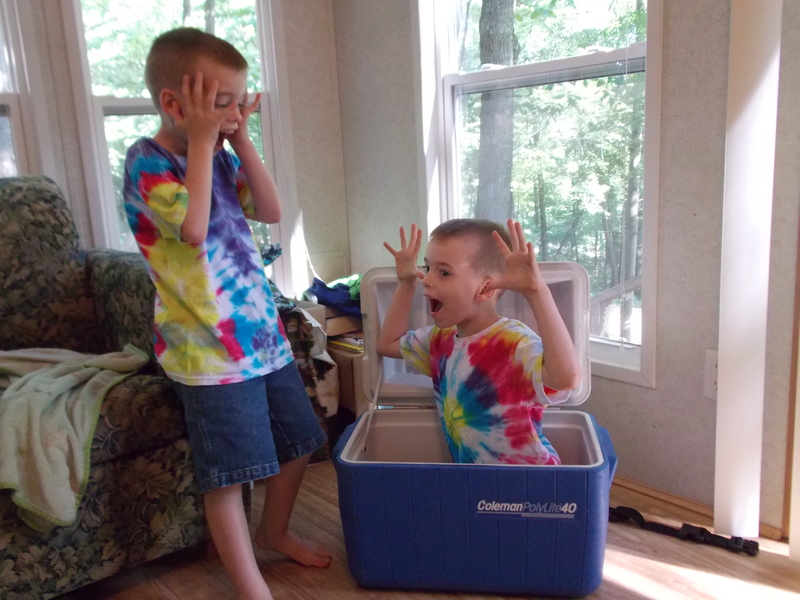 This year I had the kids make a summer “bucket list.” I had to explain to them that it is a list of goals for the summer, places you want to visit, or things you want to accomplish before summer is over. Believe it or not, though I am a goal oriented/list-making type of person, I’ve never done this! It was fun to hear what they felt was important to do while school is out. Here’s what we’ve come up with so far and I’ve encouraged them to add on to it as they think of more ideas. We’ve accomplished several of these so far and look forward to crossing more off of our list! This is a project that I had in the works a few weeks ago. My best friend was expecting her third child in May and I intended it as a baby gift. 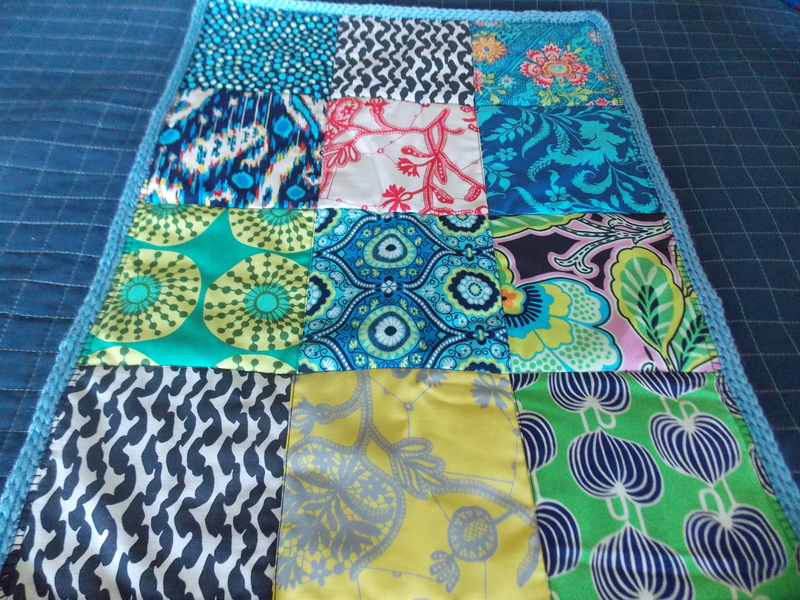 Since she didn’t find out the baby’s gender ahead of time, I wanted to make a baby blanket that was sort of gender neutral. Yes, I realize that it looks a bit more girly than boyish, so it’s a good thing that she had a little girl. 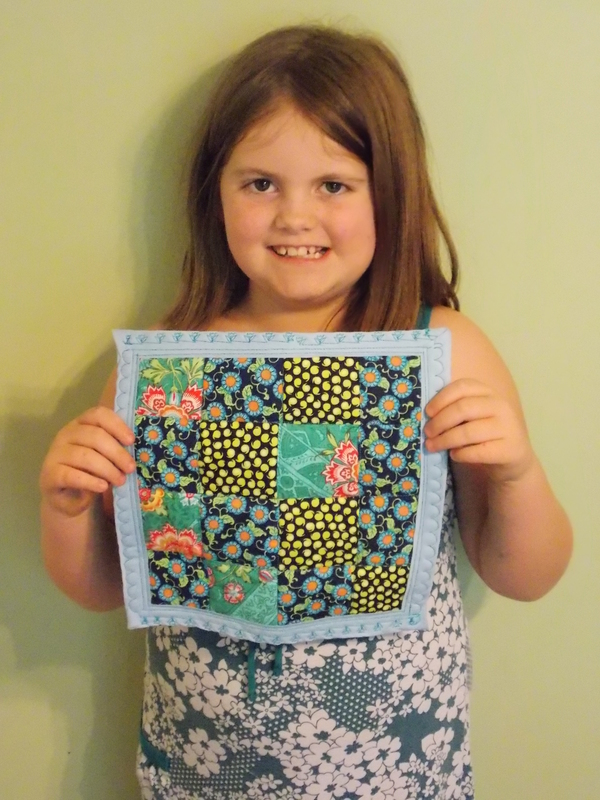 I know this sounds kind of cheesy, but I used a dark blue fabric for the back that is similar to pajama jeans material. It actually is nice and super soft, so perfect for a baby! 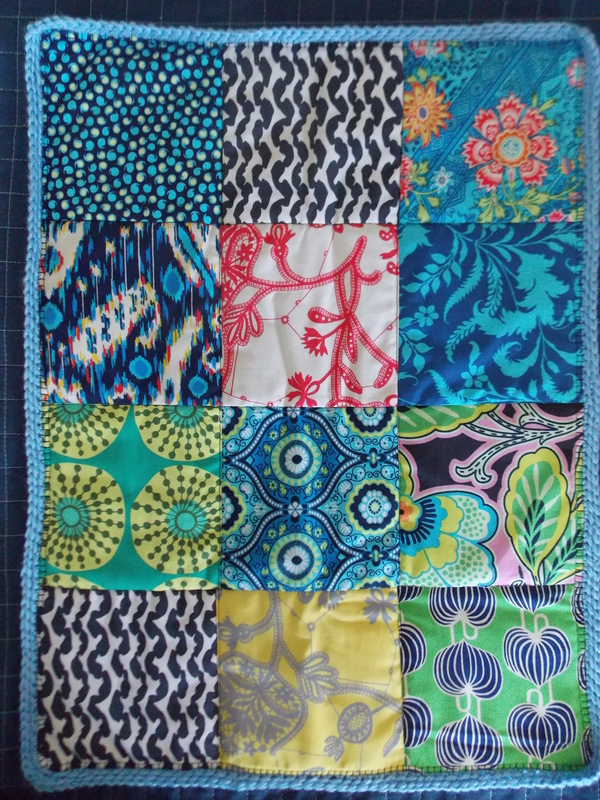 Instead of binding this like I would a typical baby quilt, I added a couple rows of blue crochet for something different. 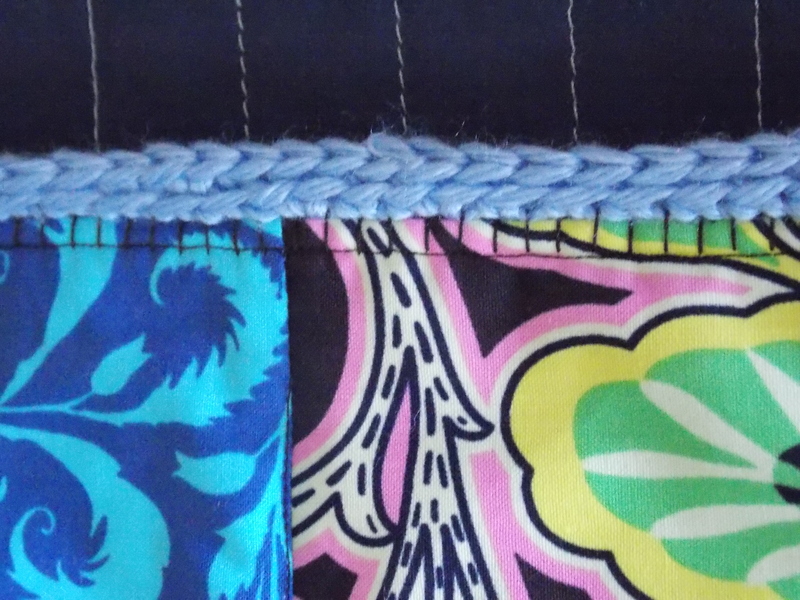 First I used the blanket stitch setting on my sewing machine, then wove this soft baby yarn through the perimeter. Using that, I did 2 rows of single crochet around the whole thing. I think it added a little unexpected touch, so I would definitely make another one with a crocheted border.